Speed River Clean Up, June 12 – Volunteer Opportunities! For the past thirty one years, in June every year, members of the Guelph community have gathered to clean up the Speed River. 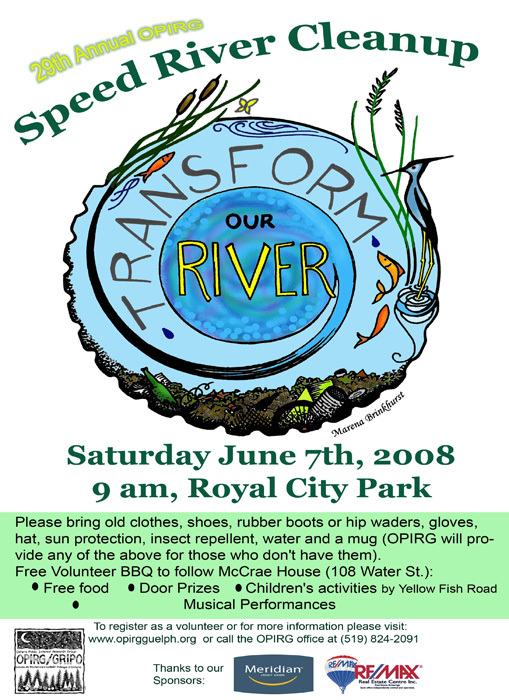 The 2010 Speed River Clean Up will be held on Saturday, June 12 at 8.30 a.m. at Royal City Park (on Gordon Street, across from the Boathouse). The Ontario Public Interest Research Group (OPIRG) – Guelph is looking forward to another fun, successful event as a part of Canadian Rivers Day! OPIRG would like to invite back all of the dedicated volunteers that have helped with the clean-up in the past, and also to roll out the welcome mat for all members of the local community to join in this worthwhile effort. After the clean-up there will be an open mic, to showcase some of our amazing local talent… and a 100 mile potluck at the McCrae House Museum on Water Street. All are encouraged to bring and share your favourite local and home-made dishes with your neighbours and community members. All participants will be entered into a draw for The Woolwich Arrow and Creemore Springs Speed River Dinner! If you would like to just help out with the actual clean-up (picking up grabage etc. 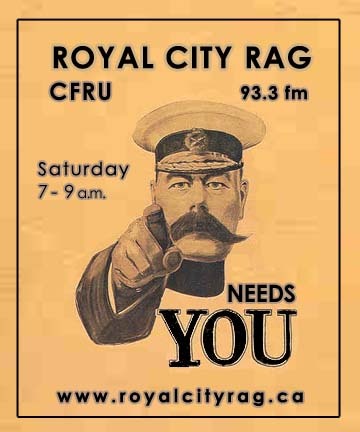 ), you don’t need to sign up before hand – just show up at 8.30 a.m. on the day in Royal City Park. If you would like to sign up for specific volunteer opportunities (below) please contact OPIRG-Guelph by June 3 at 519-824-2091 or opirgguelphvolunteer@gmail.com. Load up the vehicles at the OPIRG office, last minute errands, start the set-up. Put up signs, organize hip waders, garbage bags, crew leader kits, free coffee and breakfast food, etc. Sit at the Registration table, assign participants to crews, and answer questions. Walking with the “crews”(of up to 20 people) to a pre-arranged section of the river and supervising the picking up of garbage (as well as picking up garbage yourselves). You are also responsible for writing down the names of the people in your group and recording interesting objects they retrieve from the river. (Please note: Crew Leaders must be at least 19 years old.) Please let staff know beforehand if you’d like to sign up for a particular river sector and it you will be bringing a vehicle that you’d like to use. Nature interpretation skills are an asset, but definitely not necessary. OPIRG-Guelph will be holding a pre-clean-up tour to give you an orientation to the river, it’s ecology, history and health. Help set up lunch items, serve food, hand out door prize tickets and help with the take down after the event. Help clean up and return supplies to OPIRG-Guelph. Enjoy taking pictures? Why not take photos of Guelphites cleaning their community? When 8.30 – 11:30 a.m. Remove garbage from the river and the riverbanks! You can sign up before hand, or just show to register in Royal City Park on the day. You will also be able to enjoy a Community 100 mile Potluck Lunch afterwards in the grounds of the McCrae House Museum. Entertain the hard working clean-up volunteers while they snack and mingle! We want you to jump up on our open stage and showcase the amazing talent that this city has to offer. Anything goes! Poetry, acoustic instruments, or whatever you do best is welcome! Please contact OPIRG-Guelph by June 3 at 519-824-2091 or opirgguelphvolunteer@gmail.com to sign up for any of these positions. 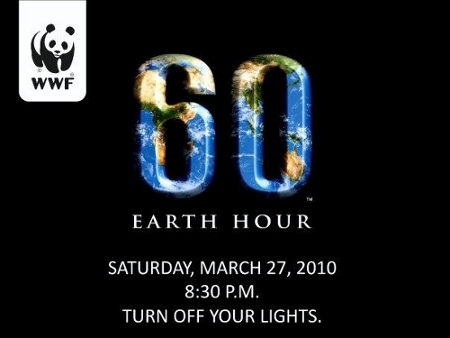 For more information, please visit www.opirgguelph.org. Interested in activism and social change? Want to share your story? Storytelling For Social Change, a Guelph student group, have a special event, “Roots of Change” taking place on April 1 from 6 – 11 p.m. in the Ed Video Gallery, 40 Baker St, Downtown Guelph. Four local activists from the campus and local community will share their stories of change and activism, followed by a discussion period. The event will be recorded for broadcast on CFRU93.3fm. RSVP to this event via Facebook here. Come to open your mind, open your hearts, establish new connections, and see a new light or perhaps find something you think is worth fighting for… bring your ideas and positivism and together we will learn from each others stories and make a difference in our community. 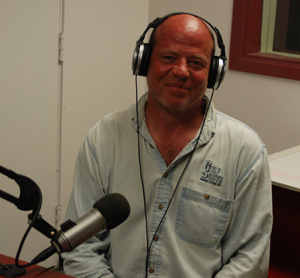 Catch the organisers of Roots of Change on CFRU 93.3fm’s Royal City Rag on March 27 between 7-8 a.m. Journey with us along the Speed River and back through time! Knowledgeable and experienced tour leaders will share the ecological facts and heritage of Guelph’s magnificent and integral river system. Attendees will discover why Guelph was settled around the river and how human settlement has affected the health of the river and why we need to turn back the clock to re-vitalize the river ecosystem. The final tours of the season take place on Sunday August 9 from 2.00 – 4.00 p.m. and Wednesday August 12 from 6.30 – 8.30 p.m.
All tours meet and finish at the Boathouse, 116 Gordon Street. Suggested $5 donation per person (ice cream at the Boathouse included)! Children under 12 are free (ice cream not included). 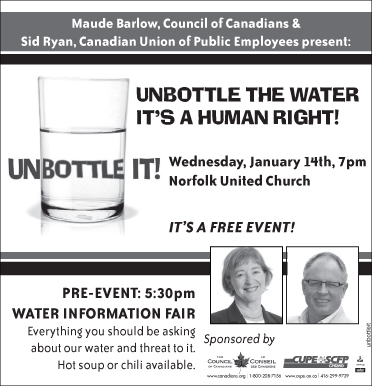 Maude Barlow, National Chairperson of the Council of Canadians and United Nations Advisor on Water, will be back in Guelph at Norfolk United Church on Wednesday January 14 2009 to talk about water as a right and not a commodity and why we should dump bottled water. She will be accompanied by Sid Ryan, President of CUPE Ontario. The goal of this visit is to build on local successes at banning bottled water from schools and municipalities, promote new bans, work toward a provincial ban, and help link bottled water to the commoditization of water in people’s minds. Beginning at 5:30 p.m., there will be a Water Information Fair featuring representatives from CoC-Guelph, CUPE, Wellington Water Watchers, OPIRG Speed River Project, Transition Guelph, Kairos, TapIn, OXFAM and others. There will also be hot chili (vegetarian or con carne), buns, and coffee or tea. The evening presentations will start at 6.45 p.m.
How Do Farmers Feed Cities? Sponsored by Ontario Public Interest Research Group (OPIRG-Guelph), “How Do Farmers Feed Cities?” is an event featuring Prof. Ann Clark, U of G Plant Agriculture, discussing genetic modification, Henry Stevens, a local farmer, and a musical performance by Sheesham & Lotus.